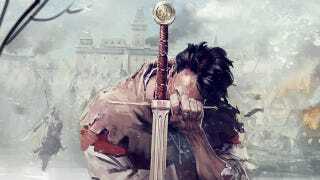 For the past week or so, Warhorse Studios has been teasing some new information about their upcoming historically-inclined RPG, Kingdom Come: Deliverance, on their website. There was a big countdown clock and everything. And now, the cat's out of the bag: Kingdom Come will be crowdfunded! Surprise! Now, from our standpoint, there are advantages to this, of course. A cheaper pre-order price (roughly $24), a chance to shape the game in some way, or to straight up immortalize yourself on, say, an in-game church painting. There will also be a degree of early access in the form of alpha and beta releases. In return, there's the whole blindly-giving-money-to-people-you-don't-quite-know dealio, in case the campaign gets funded. And it just might! In the few hours the campaign's been up, it managed to rake in over £22,000, which translates to over $35k. And that's just the first few hours. The target is £300,000—about 10% of the game's total budget—an amount which, if reached, will prompt Warhorse Studios' main investor to fund the rest of development. If you'd like to take a look, the project can be found here.